Jello molds or moldes para gelatina are as versatile as Jello desserts themselves. 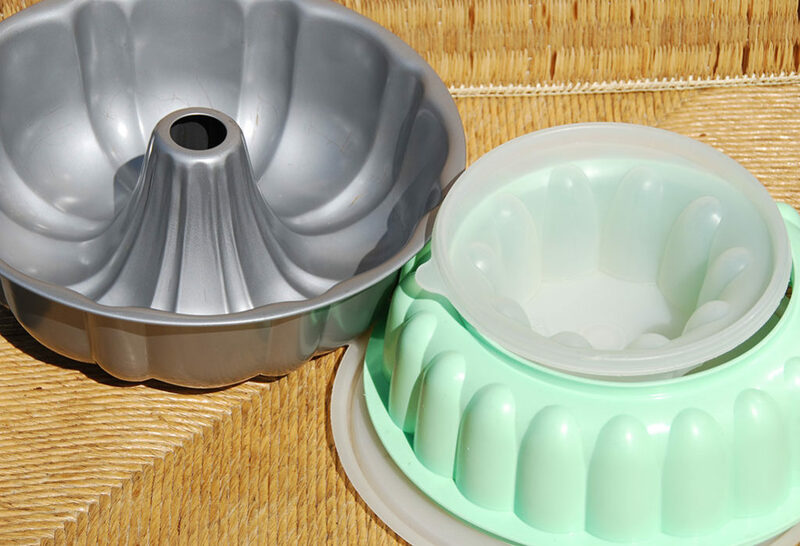 Plastic, metal, ceramic, stoneware, porcelain, glass and silicone are all suitable materials for molding Jello. 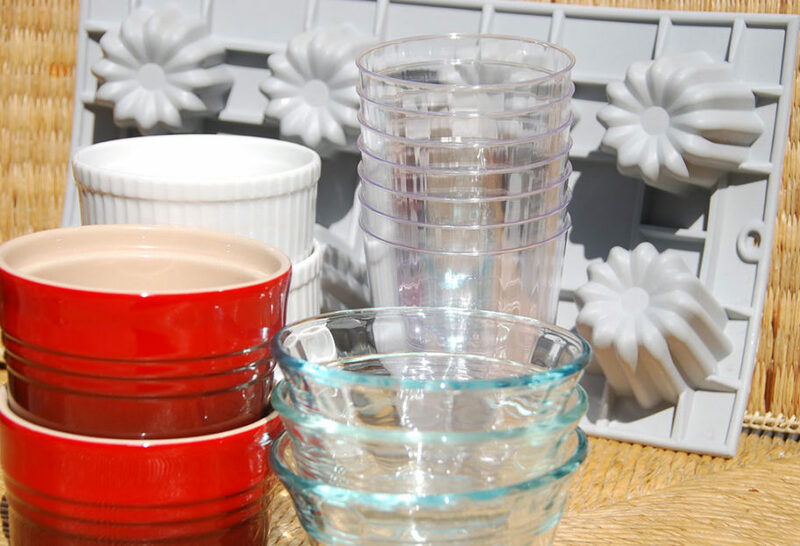 They can vary from multiserving ring molds to individual portions in plastic cups or ramekins (even water glasses or anything you can pour a drink onto! ), or in silicon shaped, like anything from pyramids to cartoon characters. It’s important to make sure your molds are heat-tolerant to avoid warping when using hot liquids. I tend to make my Jellos in clear and simple plastic cups like the ones you’d see on street stands in Mexico. It is simple, fast and you can see through all the colors and layers of your creations without having to unmold the Jello. It is also great for kids because they can just eat the Jello right out the cup. Also, in a way, servings are pre-measured. But if you want to be artistic with the shapes, aside from the flavors of your Jello creations, the newest molds are made of high-quality silicone and come in elaborate shapes. There are also large molds that can be used. Same applies as above. I even have one that comes from my mother-in-law’s kitchen, which was made in the 60’s especially for Jello. Yes, it’s true! See the green retro mold below? It is plastic, in the shape of a traditional Mexican large Jello. It has a lid to cover the Jello as it sits and settles in the refrigerator, and it has a conveniently located tight-fitting lid on the top that makes it easy to unmold the gelatin as you flip it over. Both lids help keep other savory smells from the refrigerator from slipping into your sweet Jello. If you like vintage items, plastic molds are the way to go. They come in a wide variety of shapes and are fun to search for on Esty or at yard sales, Goodwill, and antique shops. You can also use metal round, tube or bundt cake pans. They work beautifully to make layered ring-molded gelatins too. You should be able to find ring-shaped molds and individual-portion molds at your local cookware store. But the internet is also a great resource for more variety, especially if you are looking for artfully shaped silicone molds or retro plastic molds. When it is time to unmold your Jello, the most important thing is to make sure your gelatin has had sufficient time to chill (at least 2 hours in the refrigerator) and is completely set – it should be firm and not feel sticky or sag. Once set, it should slide out of the inverted mold easily with a few gentle shakes side to side. If your Jello is acting stubborn and seems too attached to the mold, try either carefully running a wet small knife (with warm water) around the top edge of the mold to loosen or filling a shallow pan or sink with warm water (but not hot!) and dipping the mold in just to the rim for 10 to 20 seconds to help loosen it up. I really enjoy your recipes, website and show! Your foods are amazing! I love that they remind me of my mom’s tradition Mexican cooking with such great flairs that you add! I plan to purchase you book as well. Felicidades with all of your success! Maribel, Thank you so much for taking the time to write me such a lovely message!! KCSM and KQED carry my show in the Oakland area — Season 3 episodes will start airing later this year. All of my very best to you.